Megan Schumacher's recruiting journey has seen her go through the commitment process twice. Every player has her own recruiting path. It's a journey that can be difficult to navigate for many. An athlete's club team can affect exposure by which tournaments that are entered, the colleges they're connected to and the regions of the country and the opportunities that exist there. But what happens when you think your recruiting path has wrapped up and then it drastically changes? Perhaps because the college head coach you committed to takes another job? That's the story of Megan Schumacher. 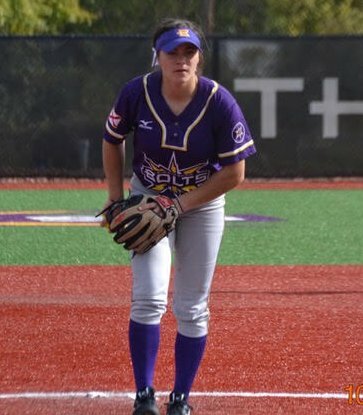 Megan began getting attention as a 7th grader when pitching at the Triple Crown Nationals, held that year in New York City. 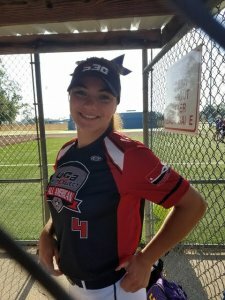 Coaches stopped by, showed some interest, asked some questions, and suddenly the middle schooler realized she might have a chance to live her dream: playing softball at the collegiate level. I continued to work hard and moved to a more competitive team, Team Long Island, which played good tournaments in the Northeast. My coach Angel Mangual put me on the 18U team and gave me the opportunity to pitch versus some of the best teams. I attended camps and combines in the Northeast and was named the top 2019 pitcher at the Top Prospects Combine two years in a row. My freshman year at the Top Prospects Combine my fastball was clocked at 65 mph and that is when the recruiting really got busy. A lot of coaches were interested in me, and I did a lot of unofficial visits and received several scholarship offers. I originally committed to Hofstra University shortly after my freshman year. I really connected with Coach Larissa Anderson, I loved how she coaches and everything she stood for and at that time I thought I wanted to stay close to home so Hofstra seemed like the perfect fit. The talented pitcher was twice named as a USA Elite Select 1st Team All-American. In the summer of 2016, I was invited to the USA Elite Select 30 camp which was held in Tuscaloosa, Alabama. I got to compete with and against some of the most talented players in the country. It was a great experience and I was so excited when I was named a 1st Team All American. That fall one of my future teammates, a catcher, asked if I could attend the Diamond 9 tournament. I went with her Newtown Rock team and there I was able to experience great competition and play some of the best teams in the country! The coach asked if I could join them in California which I did and then I guest played with them in Colorado, Texas and at PGF. They were some of the best softball experiences I had ever had. I knew I wanted to continue to play in those tournaments. I wanted to play with and against the best of the best. I was invited that summer to the 2nd USA Elite Select 30 which was held in Baton Rouge, Louisiana. I again had a great experience and was named a 1st Team All American. Megan pitching for the Birmingham Thunderbolts 18U Premier team. In the fall of my junior year, I started playing for Rocky Thompson of the Birmingham Thunderbolts. He puts us in the best tournaments and really prepare us for college. He and Coach Katelyn Boyd are the best coaches I have played for. They always really push me and continually raise the bar of their expectations which I absolutely love! Some new college coaches began to express interest in me, but I was firmly committed to Coach Anderson at Hofstra. In May, Coach Anderson took the job at Missouri. She asked me to follow her but told me to take my time and think about it while exploring my options. As soon as I opened up my recruiting, I received a lot of interest and several offers from schools in the SEC, ACC, Big Ten, and several other conferences. I was so grateful to have the opportunity to explore these schools and get to know some incredible coaches along the way. 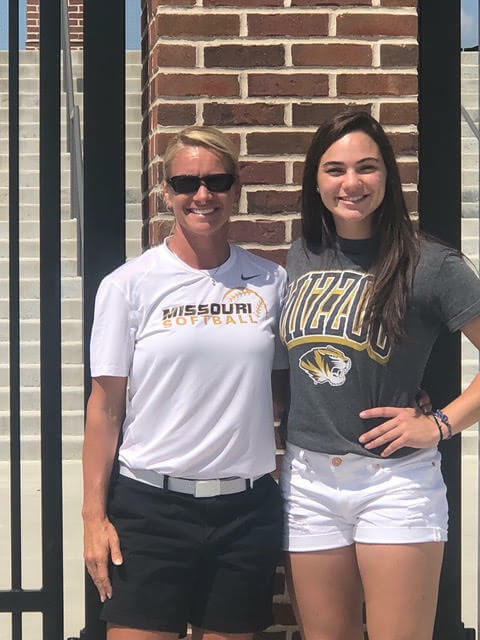 However, the first time I went to Mizzou before PGF Nationals I fell in love with everything about it: the campus, the facilities, the town, the people. I finished my visits and narrowed down my options, but Mizzou and Coach Anderson were in my heart. I returned to Mizzou for a second visit August 17th and knew then without a doubt I was meant to play for Coach Anderson at Mizzou. I committed that weekend and cannot wait to be a Tiger. I feel extremely blessed to have this opportunity and can not wait to represent my hometown in the SEC! What advice would you give young prospects about the recruiting process? I'd tell young recruits, "Don't Stress!" Take your time, take everything in, explore all your options because you never know what you will like. And what you think you want at 13 or 14 may be totally different at 17 or 18. Everything will work out the way it's supposed to! Megan originally committed to Coach Anderson at Hofstra and was ultimately invited to follow her to Miissouri. What would you do differently if you could as far as being recruited? What would you say was the best thing you did in the process that helped you? The best thing I did was be myself. I just went out on the field and played my heart out because I love to play! I tried not to think about playing college ball or the recruiting when there were coaches watching me. I was just out there competing trying to win! I am very lucky to have been surrounded by wonderful coaches and a very supportive family. I have been working with an incredible pitching coach, Julie Bolduc, since I was 13. Finally, what is it about softball you love so much to work so hard to get to the SEC? There are so many things I love about softball: I love being part of a team, all of us working together! I love the camaraderie -whether we win or lose we do it together. I love that it really is a game of inches and precision. An inch here or there could mean an out, a strikeout, a home run or a great play. Pitching has been my passion. I’ve had a drive and determination to be the best pitcher I could be since I was young. I love the battle with each batter. As I started playing better and better competition, I realized I could compete with those girls. I wanted to compete with them. Being given the opportunity to play in the SEC is a dream come true!